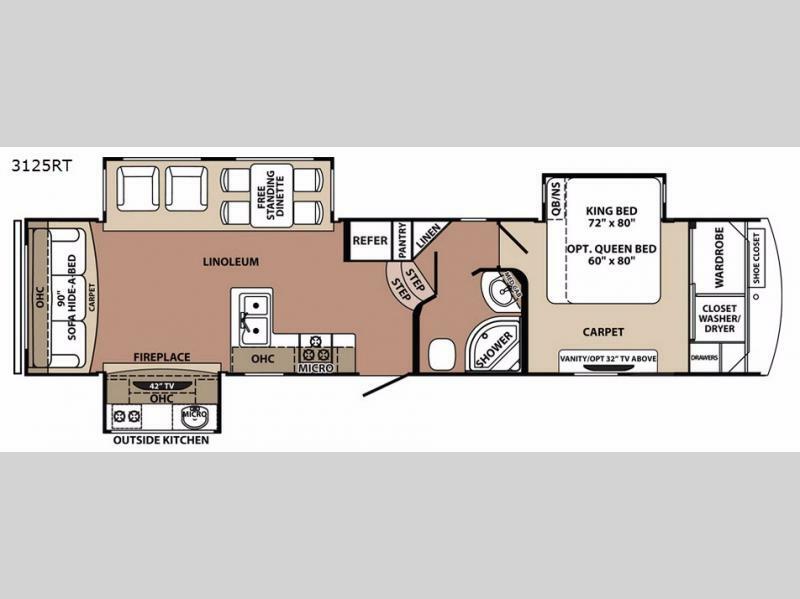 The Forest River Blue Ridge 3125RT fifth wheel features an outside kitchen for the outdoor chef in the family, a rear living layout, and fireplace, plus more! As you enter this model, the kitchen is to the left. In the kitchen there is a three burner range, a double kitchen sink, and lots of counter space. 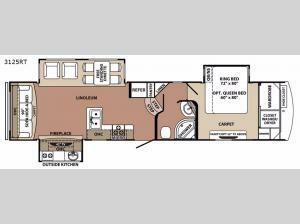 Along the opposite side of the fifth wheel there is a pantry, refrigerator, and slide out with a free standing dinette and two lounge chairs. Along the rear wall you will find a hide-a-bed sofa and an overhead cabinet which helps to keep your things tidy. Adjacent to the rear wall, along the door side there is another slide out with a 42" LED TV and fireplace which is great for those chilly evenings. Stepping up the stairs to the left is a linen cabinet. The bathroom is on the right and has a toilet, corner shower, sink, and medicine cabinet. The front bedroom offers quite a bit of space with a king bed slide out along the road side of the fifth wheel, front wardrobe, drawers, and a large vanity with an optional 32" TV above the vanity. The bedroom is also prepped for a washer and dryer. For the chef in the family, you will love the outside kitchen which features a two burner range, sink, microwave, and overhead cabinets, plus so much more!